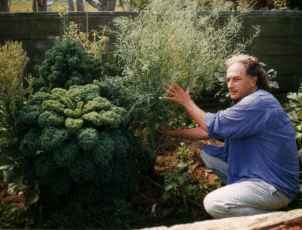 This is a picture of three Kale plants – in January 1999 – all planted from the same punnet at the same time – August 1998. The front one was sprayed with ‘Pest Protection (PP)’ while the one I am holding was sprayed with a ‘Flowering Spray’. The third – in the middle back- was initially sprayed with ‘Pest Protection’ but had subsequently been sprayed with the ‘Flowering Spray’ and can now been seen to be beginning to be going off to seed. The ‘Pest Protection plant’ in the front did not go off to seed until the end of the second season. Another kale plant in another part of the garden which was sprayed with ‘PP’ did not go off to seed at all and eventually died of exhaustion at the end of the third season.